Betsy DeVos has raised what she called a "red warning flag" regarding student aid, which she referred to as "a crisis in higher education." Speaking during an annual training event for financial aid professionals, the head of the U.S. Department of Education made statements that suggested her agency would seek policy changes to remove the federal government from the business of student loans. According to DeVos, the student loan balance in the United States grew from $500 billion in 2007 to $1 trillion in 2013. Five years later, she said, Federal Student Aid, the federal office that runs the program, "holds nearly $1.5 trillion in outstanding loans." That's a portfolio, she added, with "too many loans [that] are either delinquent, in default, or are plans on which students are paying so little, their loan balance continues to grow." She reported that more than four in 10 loans (43 percent) are currently considered "in distress." DeVos blamed the Obama administration for the current state of the loan portfolio held by FSA, suggesting that changes were made eight years ago in how student loans were managed in order to generate funding for healthcare reform. "Well, as you know, in 2010 under the guise of helping expand the Pell grant program and paying for Obamacare, the previous administration federalized the student loan portfolio," DeVos asserted. "That move was paired with a consistent drumbeat of not-so-subtle signals that a traditional 4-year college degree is the only path to and measure for success. "And lots of people believed that centrally planning everything in Washington would make higher education more accessible for students, and more lucrative for the federal government. "But the opposite is happening. The parade of programs, repayment options and complex rules serves no one well. Everything has become more cumbersome and confusing for everyone. The government monopoly has proven costly to taxpayers and it hasn't been a panacea for students either." Not every member of the audience was convinced. Jason Delisle called "utterly false" the "completely illogical claim that government student lending increased because of changeover to direct loans in 2010." It's a subject he knows well; he authored a 2017 report for the American Enterprise Institute examining the changeover in 2010 from a program in which the feds guaranteed loans made to students by private lenders to one in which the government "makes all the loans itself using its own funds." As that report noted, the idea that the switch to what is now called the "Direct Loan" program "led to record levels of outstanding student debt and defaults" is a "claim with no causal basis." "First, people — human capital — are our greatest national resource. It's in our nation's interest to support individual students' interests, to support their potential, their creativity, their destiny. Every person should have the opportunity to pursue the education that's right for them. And so, supporting and encouraging a multitude of pathways makes common sense. "Second, innovation must be unleashed. If it is, it will advance opportunity, efficiency and results in education as it has in every other industry. That last remark, tweeted Colleen Campbell, an associate director for the Center for American Progress Higher Education, "is a dog whistle for 'we need to limit forgiveness programs.'" Others found DeVos's comments ironic. "If #DeVos really wanted to address a crisis in #highered, she wouldn't be opening up the financial aid floodgates to institutions that leave most of their students with poor job prospects and unmanageable debt," tweeted Michael Itzkowitz, former director of the College Scorecard under Obama and currently a senior fellow at the education arm of ThirdWay, a liberal-leaning national thinktank. Itzkowitz was presumably referring to efforts undertaken by the Trump administration to dump Obama-era "borrower defense to repayment" rules governing loan forgiveness for students who have been defrauded by their colleges, and specifically, for-profit institutions, rules that DeVos has called unfair to the colleges. According to a recent government report, while "over a million borrowers" had so far taken steps to obtain that loan forgiveness by the education agency, few have succeeded. Of the 19,321 people who had gone through a first-stage certification request and then submitted the paperwork, just 55 were granted loan forgiveness. DeVos ended her remarks with a request for more honesty among policymakers and school leaders as well as better educated student borrowers: "The federal government must become a more responsible lender. Congress must recognize and be honest about the unmistakable implications of its favored programs on students, on taxpayers, and on rising costs. Schools must become honest about their individual roles in the cost-value proposition. Every school should focus on helping each student find the right pathway. 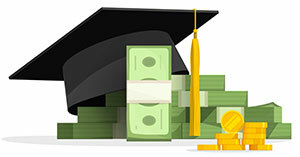 And they should help students graduate with high-quality career prospects and with low debt." "Students — our human capital — must equip themselves to be responsible consumers of education with a serious commitment to their own success. They need to have the best possible tools, data, advice and support. And then they need to understand the implications of their decisions."